I love old windmills. I think they epitomise the height of mediaeval technology and were really quite wonderful the way even the simplest worked. Unfortunately they were mostly constructed of perishable materials like wood, rope and canvas, and whereas at one time spots like the ridge of Prenzlauer Berg above Berlin were lined with windmills to catch the breeze, only a few of them have survived. 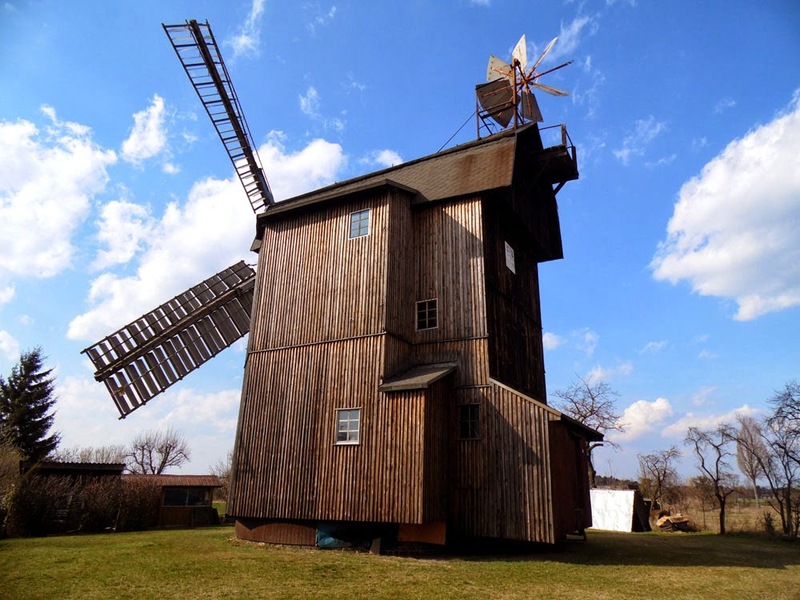 (Here is a list of surviving windmills in Berlin). Now the fields of Brandenburg are dotted with wind-farms, and we are realising that the old ways of generating power to drive our technology aren't that old-fashioned after all. So it was delightful to come across a renovated one on a bike ride through the Fläming district of Brandenburg, just above the small town of Petkus. This is the Friedensmühle or Peace Mill, so-named by local poet Richard Conrad in 1950 to mark the peacetime after the war. The existence of a mill on this site was first mentioned in the village records of Petkus back in 1542. However, this particular Bockwindmühle (post windmill) dates back to 1837, when it replaced an eighteenth century mill that had burnt down. The mill was sold to miller Heinrich Behrendt in 1927 by Otto Kostroa, and since that time has been the property of the Behrendt family, right up until the last actual miller Helmut Behrendt died in 2007, and it was inherited and restored to its current condition by his son Helmut Behrendt (junior). Well, not really in private family ownership all that time, because this is former communist East Germany and in 1960 the mill was taken over by the Landwirtschaftliche Produktionsgenossenschaft (Agricultural Production Co-operative), thankfully better known as the LPG. This meant it wasn't exactly State-owned, but was a business in private ownership of the collectivised LPG. Business operations were discontinued by the LGP in 1977, and thereafter the windmill went into a seemingly unstoppable decline. 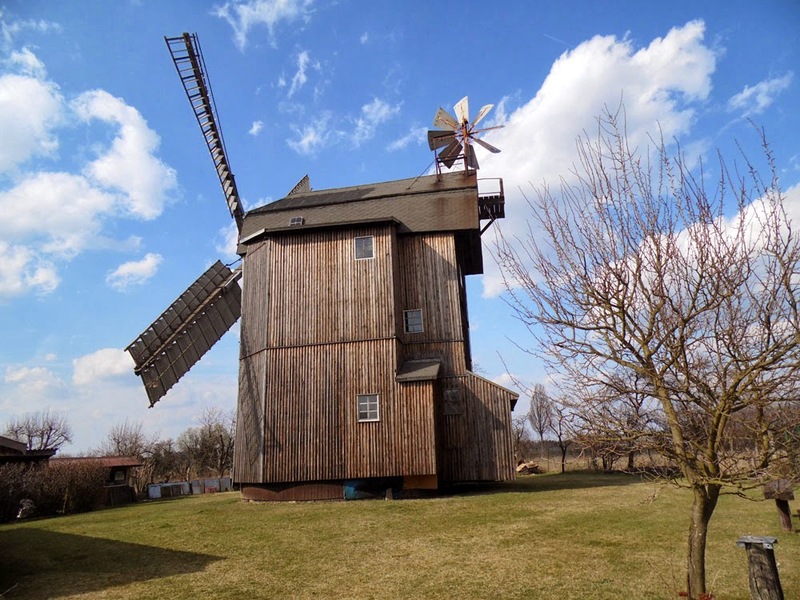 The surprise fall of the DDR and the reunification of Germany in 1990 brought the selling-back of the windmill to the Behrendt family, its reconstruction between 1991-96 by Helmut Behrendt (senior), and its use once again for grinding flour. It is a shame that it isn't a working mill any more, but it does look pretty handsome up on the hill, looking out over its modern-day descendants the wind-turbines in the distant fields. Stop Press! My Nearest and Dearest has pointed out that when you zoom in on one of her photos, you can see that the windmill is now 'zu verkaufen' (for sale). Here is your once-in-a-lifetime opportunity to own your own windmill and re-enact Windy Miller scenes from Camberwick Green!